While only experience will allow you to survive in the long run, here are few important tips to get you started. Avoid the forest map as it will be lacking in food and mid-game resources (there are a lack of buildings to loot). Instead go for a City or Roadside map. To have a good balance of rocks and wood I'd suggest that you go for a Mixed or Arid terrain. Increase the vegetation and resources sliders too while you're at this menu. 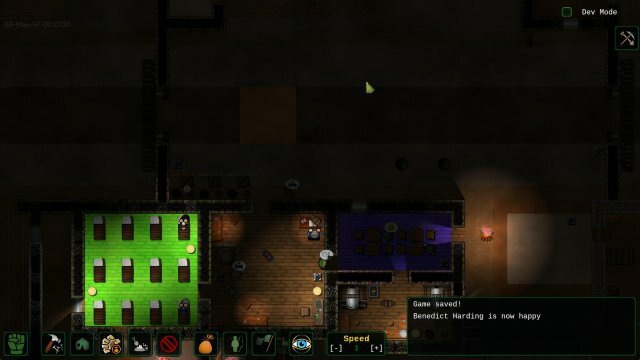 This should give you a map with a pretty good quantity of loot, food and basic resources. The standard event manager is the most balanced. You'll have several days to prepare before any potentially negative event happens and threats ramp up quite slowly. 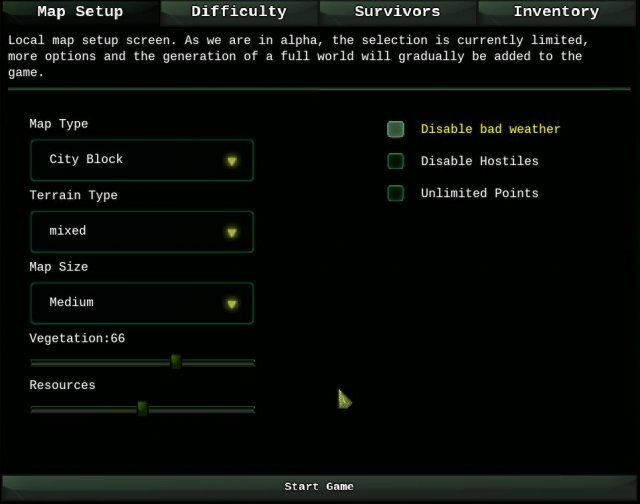 Of course, if you really don't want to deal with anything bad during your first game, you might want to select the Passive world option. This is where you can name and set up your initial group. You might get tempted to go for more than 8 people, but I'd strongly advise that you only start with 6 to 8 people as it will be much easier to keep them fed. This people is the perfect amount until you can produce water and food of your own. Check the options to give your people basic weapons and armor. 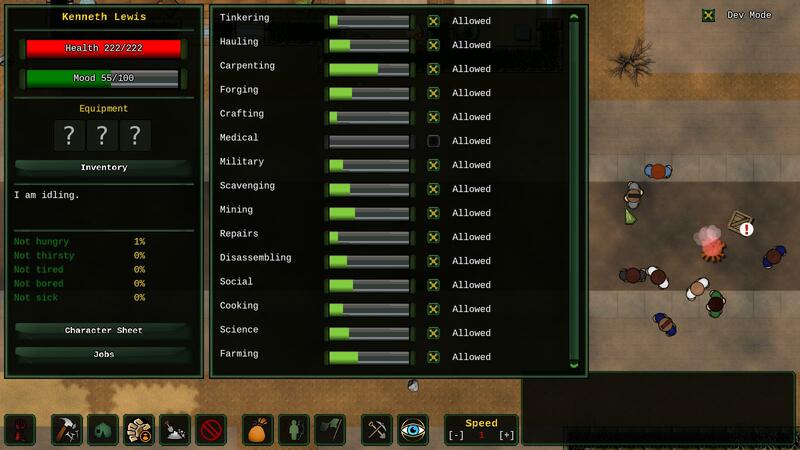 They won't have a lot of ammunition, and you'll probably have to equip them with something else later down the line, but it will give them a fair chance against any early raiders. This is where you can choose your starting equipment. Use the menu on the left to add items. Right click an element in the large list to remove it. 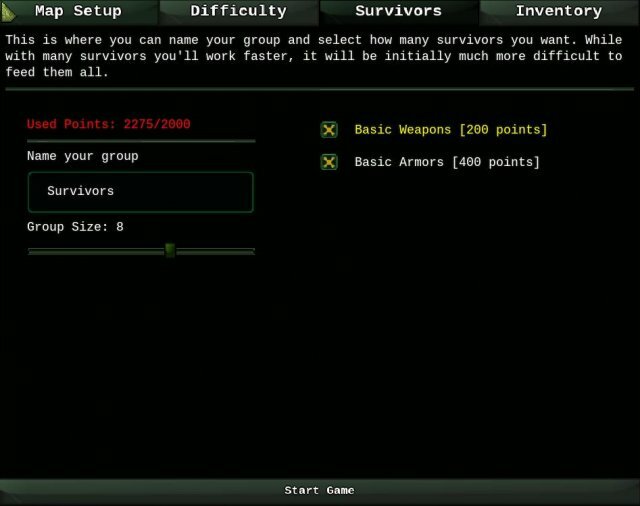 You have a limited amount of funds to allocate, and you just spent some to give your survivors weapons and armor. You should keep the newbie pack, but I'd suggest that you remove the 2 spears. That should leave you with enough more to buy 10 more potato seeds and 1 more purified water bottle. 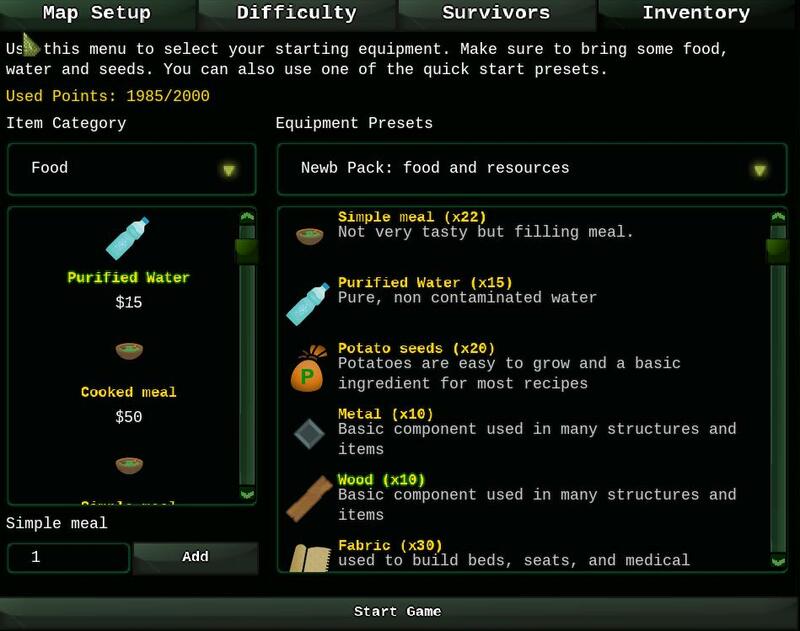 You could probably further optimize your starting position by removing the metal and stones and replacing them with simple meals. After the Collapse features an active pause you can toggle on/off using the space-bar. Use that feature often. This allows you to have all the time in the world to decide where to build stuff without your survivors starving to death. The first thing you'll want to do is to find a good location for your base. The more you can reuse existing walls and buildings to design your future base, the less resources you'll have to spend on erecting new walls. 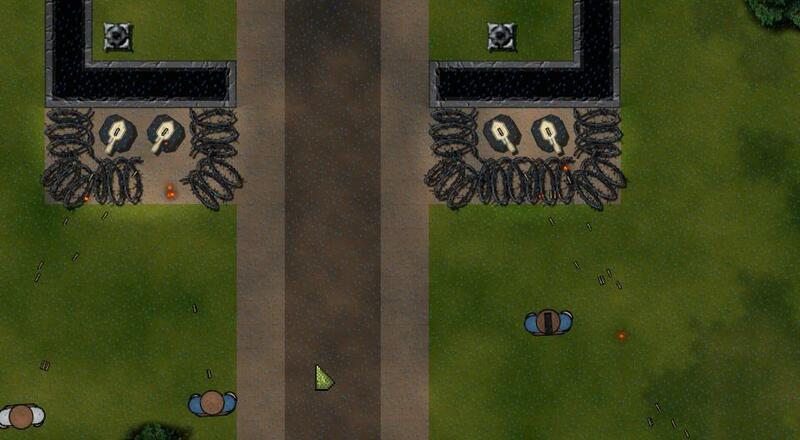 Note that the furniture on the map is considered unusable, your settlers won't sleep in those dirty, irradiated beds. But they'll happily disassemble them for parts. 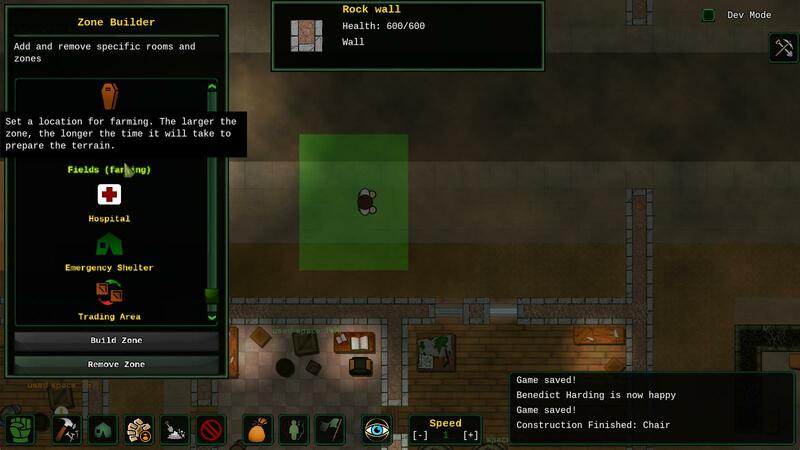 In the screenshot above, I selected four buildings close to the road, using the road as a entrance/gate to the base. 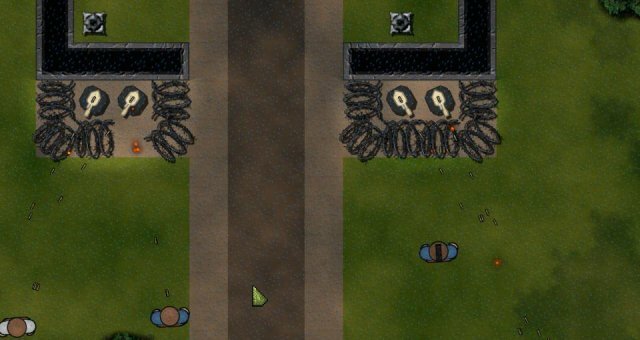 All I had to do was to close off the space between some of the buildings with cheap walls. Your starting supply will only last for a few days. After that, you'll be on your own. Don't build it too big at first. 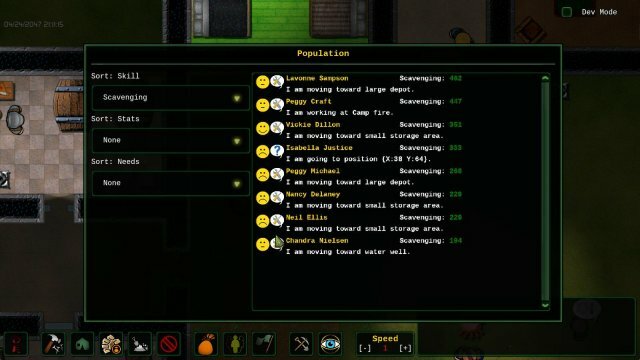 The bigger the farm, the longer it will take for your survivors to make it. If you've followed my advice earlier, you should have 30 potato seeds. Build two 3 by 5 farms. Two of your survivors should start heading toward the farms. When you're done designing the farms, click on each of them to open their respective menu and make sure to select the appropriate seed (potatoes). It will take several days to prepare the soil and plant the seeds. It will take even more time for the plants to grow. Meanwhile, you'll likely find food ingredients to be cooked in your basic kitchen by razing fridges and food boxes (found mostly in houses and restaurants). Rain-collecting barrels are the only way to collect water until you get the masonry tech. Research masonry very early (probably first) and then build a water well to replace them. Dirty water should be boiled at a campfire to make it safe to drink. Most structures and recipes require metal and coal, both of which can be made from stones and wood at a forge. As such you should build 2 forges relatively quickly, each one dedicated to the production of each. The "Build until X units in storage” option is very useful here. Avoid asking your group to raze too large of an area at once. I know it might sound tempting, but they aren't very good at prioritizing stuff, and razing stuff takes time. A bedroom with as many sleeping bags as you have people. A dining room with a few tables and chairs. Two forges: one building metal, one building coal. One or two farms (still under construction, most likely). Two rain collectors (to collect dirty water). One campfire (to boil dirty water). A basic kitchen (with meal making recipes queued in loop). You should also setup a Trading Zone quickly. It's free, and traders won't show up until you have one. Just make sure it's not in an enclosed space. Not all of your settlers will be good at any task, and it's key to make sure useful people like your scientist, doctor or cook are not wasting their time hauling rocks and wood around the map instead of performing more critical tasks. 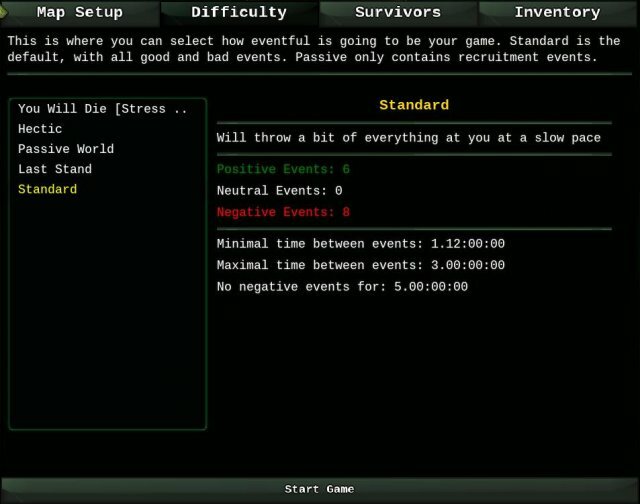 This menu, opened by pressing F3 by default, allows you to sort your survivors by skill. When sorted by skill, right clicking on a particular survivor entry will toggle that skill on (green) or off (red). 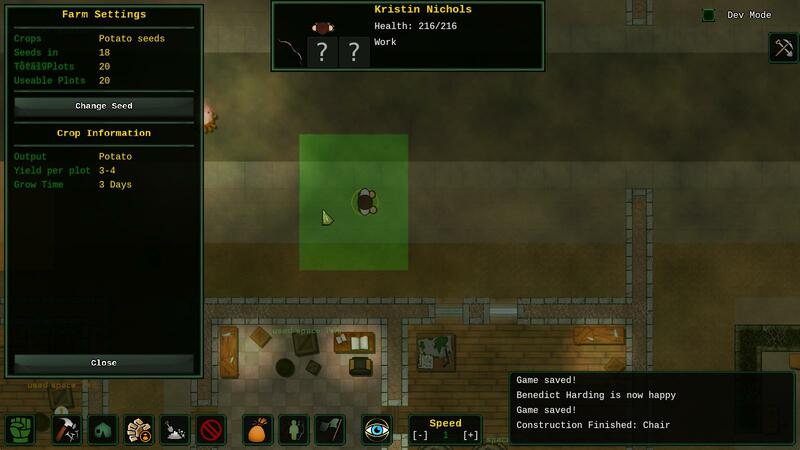 A double-click will open their individual menu from which you can access their skills. Click the Jobs button and toggle off all the skills except cooking.